• Exhibition set vs. Red Eleven: At 7:30 p.m. Saturday, the Chicago Red Stars face their W-League affiliate, the Chicago Red Eleven, in a scrimmage at the Village of Lisle-Benedictine University Sports Complex Stadium, 5700 College Road, in Lisle, Ill. Following that match, the Red Stars return to Women's Professional Soccer play with four straight road matches, beginning Wednesday, June 3, against the Los Angeles Sol. Chicago hopes to break out of its scoreless spell, which has reached 308 minutes. • Scheduling changes: Earlier in the week, the Red Stars made some scheduling changes. Chicago hosts the Boston Breakers at 3 p.m. Sunday, June 21 (was previously set for June 20), and the Red Stars' July 26 match against the Washington Freedom starts at 3 p.m. (was previously set for 7 p.m.). • Broadcast additions: Comcast SportsNet will televise the June 7 game in Santa Clara, Calif., and the July 12 match at Toyota Park. Both games will air live at 7 p.m. in Chicago. Was it a push or wasn’t it a push? Brian McBride sold it, and that’s all that mattered for the Chicago Fire. On the road, whether it’s conventional, or panicky, or lucky, a win is a win. And they did it on the home grounds of the top point leaders in Major League Soccer. The Fire scored two goals late in the second half and defeated Western Conference-leading Chivas USA, 3-2, on Thursday night at the Home Depot Center in Carson, Calif.
Cuauhtemoc Blanco scored two penalty kicks - one in stoppage time in the second half - and Patrick Nyarko contributed a game-tying goal as the undefeated Fire improved to 5-0-6 and 21 points to extend their Eastern Conference lead. Chivas USA (7-2-3, 24 points) lost for the first time at home this season. In the closing moments, McBride drew a foul from Mariano Trujillo. Replays showed there might have been some minimal contact. In any event, Blanco took the PK for the second time past Chivas goalkeeper Zach Thornton for the victory, capping off a perfect 3-0 road trip. Blanco now joins the Mexican National Team in preparation for training for a World Cup qualifier and will not be available Sunday when the Fire host FC Dallas at Toyota Park. Blanco’s other PK came in the 25th minute. Before netting the goal, Wilman Conde’s jersey was pulled by Chivas defender Shavar Thomas on a ruling that was assisted by the sideline referee. The turning point of the match was when Chivas midfielder Jesse Marsch was called for a second yellow card in the 63rd minute. Chivas had a 2-1 lead at that point and actually continued to find some chances to add to the lead. But in the 89th minute, Chicago came up big with two of their second-half substitutes. Midfielder Justin Mapp played a ball from the left side that ricocheted off of Shavar Thomas and went through to Nyarko, who netted the game-tying goal past Thornton. The Fire’s offensive efforts erased some lackluster defensive moments in the first half that allowed Chivas to take a 2-1 lead into the half. In the 16th minute, Paulo Nagamura had space to work with and made a deep, right-footed strike that tailed slightly away from Fire goalkeeper Jon Busch’s left, but was plausible to make a save. In the 35th minute, Fire defender Bakary Soumare was called for a trip against Maykel Galindo. And in the 37th minute, Galindo took the PK for a 2-1 lead. Next up: The Fire return to Toyota Park for the first time since May 9 when they host FC Dallas at 2 p.m. Sunday, May 31. The game is televised on My50. SlideTackles.net thoughts: Chicago pulled a magic rabbit out of a hat and everything worked in the Fire’s favor when it looked like they were in line for their first defeat of the season. For most of the game, Chivas defended the likes of McBride and Chris Rolfe quite well, limiting their touches. And on the Fire defense, they started to fall back into some isolated mistakes or shortcomings in marking that nearly cost them as a whole. They gave up too much space for Nagamura’s deep strike, and Busch knows he probably should have stopped the shot, too. Then there was Soumare’s decision to lunge at Galindo resulting in a penalty. It was not necessary because he had some good help to his right from John Thorrington. All that said, the Fire pressed on, and credit head coach Denis Hamlett with making some key substitutions in Nyarko and Mapp for Tim Ward and Marco Pappa, respectively. Libertyville native and UIC product Baggio Husidic made his debut and made a good run in the 87th minute, just before Nyarko’s game-tying heroics. The Fire should be in decent shape for Sunday’s game against Dallas, despite the absence of Blanco. The PK attempts were clutch, and he made a couple of passes late in the game that were on cue. But beforehand, his passing was sub par and his field vision was off the mark. Mapp can definitely play more of a role against Dallas. Due to time constraints, full-fledged previews for Thursday's Chicago Fire at Chivas USA matchup and Sunday's home game against FC Dallas will not be available this week. SlideTackles.net will supply its usual thorough game coverage and analysis for both, including post-game interviews and comments this Sunday at Toyota Park. I do give the Fire some mention in Part I of my Examiner.com Week 11 Major League Soccer preview. And Part II is coming out a little later this week and will include the Fire-Dallas match. Thanks for following. Megan Rapinoe and Lindsay Tarpley of Women’s Professional Soccer’s Chicago Red Stars netted goals for the U.S. Women’s National Team as the squad defeated Canada, 4-0, in a friendly Monday night at BMO Field in Toronto. Just into stoppage time in the first half, Heather O’Reilly found Rapinoe to her left. Rapinoe cut the ball inside and bent the rock with her right foot to the far right post for a goal and a 2-0 lead. Earlier in the half, Rapinoe had a shot on goal and also had a corner kick that came pretty close to angling toward the far post through the air. But the ball neither reached the net nor a player, even though it was a playable strike that stayed in bounds. In the 61st minute, Tarpley substituted for Rapinoe, and in the 77th minute, Tarpley gave the U.S. a 3-0 advantage. Off of a corner kick, the ball bounced around and Tarpley put a foot on the ball to cushion the U.S. lead. Chicago defender Marian Dalmy also came into the game in the second half. But Carli Lloyd was not available because of a knee injury during a scrimmage over the weekend. Crystal Lake, Ill., native and Boston Breakers defender Amy LePeilbet made a start on defense for the U.S. But she only played in the first half as Rachel Buehler came into the game for LePeilbet at the start of the second. Blanco nominated for awards: The Chicago Fire announced that midfielder Cuauhtemoc Blanco is among the nominees for the second edition of the “Tecate Premios Deportes” (Tecate Sports Awards). The winners will be revealed on June 25. Blanco is nominated for Soccer Player of the Year, Offensive Midfielder and Athlete of the Year. Nominees are considered based on the athlete’s statistical excellence, participation in a televised professional sport in the U.S. during 2008, cumulative impact on their team and in the sport, and their reputation as a role model for the Hispanic community. Fans can vote by visiting Univision.com. Soumare to chat on ESPN.com: Fire defender Bakary Soumare will chat live with fans through ESPN Soccernet at 2:15 p.m. (CST) on Tuesday. Fans can submit questions and follow the chat by CLICKING HERE. The Fire take on Chivas USA on Thursday in a battle between the conference-leading squads. The game will be televised on ESPN2 and ESPN Deportes. Vote for Rolfe: The Chicago Fire’s Chris Rolfe is up for MLS Goal of the Week for Week 10. His strike was the lone goal during Chicago’s road victory against the New York Red Bulls on Sunday. CLICK HERE to vote for him or your other favorite MLS player at MLSNet.com. Chicago Fire midfielder Chris Rolfe scored the lone tally and goalkeeper Jon Busch came through with 10 saves as the Fire defeated the New York Red Bulls, 1-0, in Major League Soccer action Sunday afternoon at Giants Stadium in East Rutherford, N.J. The Eastern Conference-leading Fire improve to 4-0-6 and are two games shy of tying the MLS record for the longest unbeaten streak to start their season. New York falls to 2-6-3. Rolfe’s goal came just before halftime, and was conjured up in a flash. Busch started the attack with a deep ball that was headed by Brian McBride toward the middle of the field. Logan Pause rushed in from the back and headed the ball forward to Rolfe, who turned and fired the left-footed shot to the far post past Red Bulls goalkeeper Jon Conway. The flow of the game went back and forth at times, but for the most part the Red Bulls were the ones on the attack - a huge difference compared to the New York team that fell to Chicago, 1-0, earlier in the season with a one-man advantage. The Red Bulls’ Juan Pablo Angel had several scoring chances in the first half. And then the rest of his team jumped on the bandwagon and forced Busch to earn his clean sheet. Alberto Celades had a strong strike from the top of the box that was saved in the 60th minute. Then in the final 5 minutes, Busch had to halt New York’s attack on multiple chances. Dane Richards got past Fire defender Bakary Soumare from the left side, but his shot was turned away. Danleigh Borman slumped over in reaction to his header being stopped shortly thereafter. Conway came up from the back and came close to getting a strong header, but the ball bounced over the net as the Fire evaded New York’s final scoring push. Next up: The Fire wrap up their three-game road trip at Chivas USA for a 9:30 p.m. game Thursday at Chivas USA. The game is televised on ESPN2. SlideTackles.net thoughts: Busch has always said that there would be games like this where he’d have to come up with an array of saves. Sunday was the time, and Busch came through to perfection. His reaction to the ball was uncanny, and he bailed the defense out on a few occasions when they were gambling for a steal on the flanks. Soumare did that a couple of times, and even Wilman Conde had a moment or two that was out of character. The guys are picking up for one another, and it’s amazing that this team could not achieve this momentum on the home front. I’m also impressed with the nature of how Chicago scored, which was almost the opposite of the character within the team’s five-game string of draws. The Fire didn’t dominate on possession. They didn’t have the ball on the offensive third for a long stretch of time. And their goal was almost conjured up on a black board before the game, with a string of great passes all the way from the back with Busch. Chicago, still touting that undefeated moniker, will face its toughest challenge to date when Chivas USA hosts the Fire in a few days. It has been difficult to gather any type of momentum throughout MLS play this season, and the Fire are one of the few squads to get something going … on the road no less. U.S. Men's National Team head coach Bob Bradley named his 24-man roster Sunday for the upcoming FIFA World Cup qualifiers against Costa Rica (June 3 at Estadio Saprissa in Costa Rica) and Honduras (June 6, at Soldier Field in Chicago). Arlington Heights native Jonathan Spector and Homer Glen native Brad Guzan are on the roster. U.S. training begins May 26 in Miami. CLICK HERE for the full article on U.S. Soccer. BRIDGEVIEW, Ill. - Typically, one shot does not add up to two goals. But that is what the Chicago Red Stars surrendered to St. Louis Athletica on Saturday. A couple of unfortunate defensive circumstances cost the Red Stars late in the first half as St. Louis won, 2-0, in Women’s Professional Soccer action at Toyota Park. The Red Stars dropped their third straight as they concluded a five-game home stand in front of 4,461 spectators. The Red Stars (2-2-3) now hit the road for four straight games and won’t be back home until June 21 against the Boston Breakers. Chicago and St. Louis (2-2-2) were both shorthanded Saturday because of training for a national friendly between the U.S. and Canada a couple of days later. The Red Stars were without midfielders Carli Lloyd, Megan Rapinoe and Lindsay Tarpley, and defender Marian Dalmy. St. Louis was without goalkeeper Hope Solo, midfielder Lori Chalupny, and defender Melissa Tancredi on the Canadian Women’s National Team. Lloyd injured her left knee Saturday in a scrimmage, will miss the U.S.-Canada friendly and could be out for two weeks, the Red Stars organization said. For the first 25 minutes on Saturday, Chicago’s defensive play denied some of St. Louis’ creative chances, and the Red Stars’ offense had some good opportunities from its front line. But in the 25th minute, the Chicago defense allowed an own goal as St. Louis took a 1-0 lead. And it went downhill from there for the Red Stars. With the first goal, the St. Louis attack came from the left side by Eniola Aluko. She struck the ball, and it bounced off of Chicago defender Ifeoma Dieke and over the outstretched hands of goalkeeper Caroline Jonsson. Athletica’s second goal developed when the ball was crossed into the middle and Kendall Fletcher took a shot that bounced to Aluko, who drove the ball into the net for a 2-0 lead in the 41st minute. St. Louis goalkeeper Jillian Loyden, normally the backup to Solo, came through with some big-time saves Saturday. In the 17th minute she turned away a Cristiane header. And in the 38th minute, Loyden skied straight up to bat away a Karen Carney strike. Next up: The Red Stars hit the road for a 9:30 p.m. (CST) match against the Los Angeles Sol on Wednesday, June 3. SlideTackles.net thoughts: The start of the game looked promising for the Red Stars. And Cristiane’s and Carney’s first-half shots were exactly the type of chances you want. Coach Hayes touched upon the mental focus during Saturday night’s press conference. And this team needs to make great strides when it comes to not getting rattled by something that happens on the scoreboard. The last positive chance in the game was Carney’s shot in the 38th minute, down 1-0. St. Louis scored a few minutes later to pad its lead and the Red Stars hardly made an impact in the offensive third the rest of the way. Chicago missed the trio of midfielders with the WNT. They are much stronger at handling the ball. They are much better when it comes to winning 50-50s. Frida Ostberg (pictured above) clearly was running all over the place to try and do her part. Brittany Klein tried to claw with the St. Louis midfield, but she struggled in one-on-one situations, whether she was battling for a 50-50 or trying to protect the ball. Ultimately, that downgrade in midfield play has a trickle effect on every third of the field. Perhaps more offensive sets would have been generated. And the pair of defensive setbacks could have been averted with the entire squad there. But, St. Louis was in the same boat with several players out of the lineup. It boils down to whether a team’s depth can fill a void, and the Red Stars came up short. In my opinion, there were very few glimpses that stood out from some of the new starters on Saturday. Jill Oakes appears to have some potential. She displayed some versatility on the field and appears to strike the ball well. The Red Stars now see themselves tied with St. Louis for fifth place. And with a four-game road trip on the horizon, the Red Stars have their work cut out when they battle the top team in the league, the Los Angeles Sol. 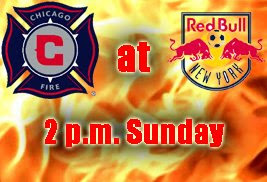 The Chicago Fire head to New York to take on the Red Bulls for the second game of a three-game road trip at 2 p.m. (CST) on Sunday at Giants Stadium in East Rutherford, N.J.
Chicago (3-0-6, 15 points) is coming off a 2-0 victory at Toronto FC last week, while New York (2-5-3, 9 points) salvaged a 1-all draw against Houston, thanks to John Wolyniec's late heroics. New York midfielder Jorge Rojas is out for Sunday's match. He was red carded after a reckless elbow to Houston's Brian Mullan. Rojas has two goals and an assist on the season. The last time these two teams faced, New York had an early man advantage after Fire midfielder John Thorrington was given a red card. Yet Chicago managed a Marco Pappa shorthanded goal and went on to win, 1-0, at Toyota Park in Bridgeview. The Fire's performance against Toronto certainly was a strong indicator that this team has found some mojo after five straight draws. "Our guys dug in and did a good job defending," Fire head coach Denis Hamlett said. "I was just happy about our commitment of doing all the little things and getting the job done." On the flip side, the Red Bulls have two wins (against the West's struggling Real Salt Lake and San Jose Earthquakes) and are coming off a dreadful defensive performance on Wednesday. New York fell into a four-goal deficit in a span of 26 minutes against D.C. United as the Red Bulls dropped their U.S. Open Cup play-in match, 5-3. Rojas did provide two late goals in this non-MLS affair. SlideTackles.net prediction: So the Fire's string of draws came to a close as Chicago righted the ship at the perfect moment last week on the road. It is difficult to give New York much of a chance considering what happened during the last meeting. It's also difficult to compare the two teams within that game because Chicago's mind-set completely changed. They managed the shorthanded goal, and it was a defensive-minded effort from there on out. That is why Cuauhtemoc Blanco did not even get into the game. New York's defenders will have their hands full, and its midfield will be a little weaker without Rojas. Chicago's attack provided enough juice in the second half to get past the Reds on their home turf. And Brian McBride has been a steady goal scorer all season. Some of us are probably already salivating at next week's high-powered matchup against Chivas USA. But the Fire have to stay in tune with a 90-minute performance against New York. The last thing Chicago wants is to slip back into that lone mishap tendency that has bitten them several times, turning a potential victory into a draw. For those of you Chicago Red Stars fans who took advantage of the ticket deal that includes a Lindsay Tarpley Bobblehead, you won't be seeing the actual player on the field. Or three others for that matter this Saturday. Midfielders Tarpley, Megan Rapinoe and Carli Lloyd, and defender Marian Dalmy are training with the Women's National Team for an exhibition against Canada two days later. That means there will be some big shoes to fill and new faces getting the starting nod as Chicago hosts St. Louis Athletica for a 7:30 p.m. Women's Professional Soccer tilt at Toyota Park (no TV; Spanish-language Web cast on ChicagoRedStars.com). These are obviously some heavy-duty losses from Chicago's perspective, and the Red Stars (2-2-2, 8 points) are hoping to erase their two-game losing streak and cap off a five-game home stand on a high note when St. Louis (1-2-2, 5 points) comes to Bridgeview. "Training's been great this week, and the other players realize they have to step up," Red Stars head coach Emma Hayes said. "The team's very humbling. They all feel they are good enough to start." The glaring position where Chicago will need an added presence is in the midfield. Frida Ostberg has contributed as both a defender and midfielder this season, and midfielder Brittany Klein (pictured left) will need to be more of a force, as well. They are already staples for their aggressiveness and hustle on the pitch. "Frida's got the experience and energy level, and Brittany is the sort of player who with the more responsibility, the more she drives," Hayes said. "You're going to see a different role from her." Hayes rattled off an assortment of names who should see an increased role, with the likes of forward Ella Masar (who has two starts in six games), midfielder Danesha Adams, midfielder Heather Garriock and midfielder Jill Oakes all having the opportunity to "prove their worth" on this team. Hayes admits that even the coaching staff is not sure how things will pan out this week because this will be such a different lineup. But the players are taking this on as though they have a chance to secure a starting role here and there, and not approaching this with a "fill-in" attitude. There are some Red Stars, though, that have stamped their starting presence. Goalkeeper Caroline Jonsson has been the Red Stars' security blanket all season, to the point where she has single-handedly been the reason for the team pulling off a victory or a draw. And Chicago has its forward tandem of Cristiane and Karen Carney. Carney has a goal and an assist this season. Cristiane, who has yet to tally a goal or assist, is just now getting some full-game minutes following some international duty with Brazil and an early knee injury. This is no question that she is a play maker, and if the offense can find some gaps in the St. Louis defense, a Cristiane goal (or two, or several) would not be out of the question. "She's getting better every day and she's getting settled in," Hayes said. One typical defensive starter who is still making a transition to this level is Chioma Igwe. Hayes did not start Igwe last week, and it was noticeable that she needed to improve marking up against some of WPS's speedy forwards. "She's still a young player and is developing her game," Hayes said. "Putting her at left back was out of position for her, and she's had an awful lot to deal with there. Her natural tendency is defensive midfield or right back. She has had a very good week of training and has responded well to it. I think she demands a lot more from herself." 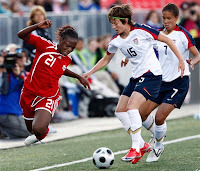 • St. Louis shorthanded, too: The WNT match against Canada puts Athletica in a bit of a hole, as well. St. Louis will be playing without goalkeeper Hope Solo, and defender and St. Louis native Lori Chalupny also will be with the WNT. They have combined for 171 WNT caps. Check out Examiner.com's Major League Soccer Power Rankings through Week 9. The Chicago Fire rose from No. 4 the previous week to No. 2 this week following a 2-0 victory against Toronto FC. The MLS Power Rankings are composed by eight MLS Examiners across the country. CLICK HERE for the piece. Former Chicago Fire draft pick Dominic Cervi will be officially joining Celtic, according to a BBC article by Chris McLaughlin. The Fire drafted the 6-foot-6, University of Tulsa product at No. 12 in the 2008 MLS SuperDraft, but he rejected the team's contract offer. Major League Soccer was fit to be tied in Week 9. For the second time this season, five of the seven games resulted in a draw. In case you have not noticed, this league is setting a new precedent in tied matches. But it certainly has made for some entertaining soccer and interesting finishes, and this week was no exception. CLICK HERE for my rundown of MLS's Week 9 action. BRIDGEVIEW, Ill. - Both the Chicago Red Stars and FC Gold Pride were coming off of disappointing shutout losses last week in Women’s Professional Soccer play. The Bay Area turned the tide, but Chicago could not break through with a goal. 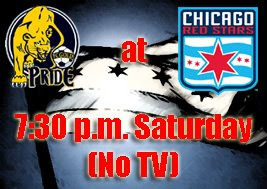 The Gold Pride topped the Red Stars, 1-0, on Saturday night at Toyota Park, and Chicago (2-2-2) dropped its second straight during a five-game home stand. “It’s a quiet locker room in there right now, because they know they could have gotten more from the game,” Red Stars head coach Emma Hayes said. The Bay Area improved to 3-3-1, thanks to an early goal and a clean sheet in the second half. This game carried quite a bit of value for the Red Stars because they will lose defender Marian Dalmy and midfielders Carli Lloyd, Megan Rapinoe and Lindsay Tarpley to the Women’s National Team next week. The WNT takes on Canada on May 25, and the Red Stars’ four stars will not be available for Chicago’s May 23 home match against St. Louis Athletica. On Saturday, the Red Stars started to create some chances on the offensive end in the first half, and the buildup was evident with Cristiane heavily on the attack, and Rapinoe the main catalyst trying to get Cristiane the ball. Then, in the 30th minute, the Gold Pride grabbed the momentum in a heartbeat. Christine Sinclair netted the only goal, unassisted. She was the beneficiary of a ball that was booted into the side from their right side and bounced away from Red Stars goalkeeper Caroline Jonsson. The ball wound up at Sinclair’s feet and she practically dribbled it all the way into the net for a 1-0 lead. In the net, Jonsson made four saves for the Red Stars while Nicole Barnhart had three saves for the Gold Pride. Barnhart made a clutch save in the 83rd minute on a Karen Carney strike. It was the best Red Stars scoring chance in the second half, but nothing mirrored their attack between the 20th and 30th minutes. Next up: The Red Stars host St. Louis Athletica at 7:30 p.m. Saturday, May 23, at Toyota Park. Not television or Web cast are available for the match. SlideTackles.net thoughts: The Red Stars needed a victory Saturday for many reasons: to rebound from their previous defeat against Sky Blue FC, to take advantage of their five-game home stand, and to capitalize on having a full roster before they are shorthanded against St. Louis. Now they have to juggle a few things around to try and match up against St. Louis Athletica. Thankfully for the Red Stars, St. Louis will be without goalkeeper Hope Solo and defender Lori Chalupny, who are joining the WNT. On Saturday the Red Stars did showcase some creativity with the ball, especially in the first half. Here are just a few moments within that buildup between the 20th and 30th minutes: Rapinoe was called offside in the 21st minute after making a quick run, otherwise she would have had the game’s first goal. In the 27th minute, Rapinoe made a fantastic touch with the outside of her right foot on a cross from the left wing, but it was just out of reach for Cristiane. Then in the 29th minute, Cristiane had a shot on goal after another good setup by Rapinoe. Thankfully Cristiane’s attacking skills are available next week. She and Carney will need to shoulder the load offensively when they are shorthanded against St. Louis. The Chicago Fire ended their string of five straight draws with their first road victory of the season, a 2-0 decision over Toronto FC on Saturday in Major League Soccer action at BMO Field. Chris Rolfe and Brian McBride (pictured) scored second-half goals as the Fire improved to 3-0-6 on the season and moved into a first-place tie with D.C. United in the Eastern Conference, with 15 points apiece. After a first half that didn’t create too many scoring chances, things picked up in the second half for both Toronto (3-3-4) and the Fire. And Chicago turned a non-call on a hand ball into a huge positive. Fire defender Logan Pause’s left arm made contact with the ball at the top of the box as Chicago cleared the Reds’ attack, and the Fire completely turned the tide when Cuauhtemoc Blanco set up Rolfe, who made a run past Toronto defender Marco Velez and then beat Toronto goalkeeper Stefan Frei to the ball for a 1-0 lead in the 59th minute. Rolfe was a halftime substitution for Patrick Nyarko. McBride’s goal in the 81st minute sealed the deal. Rolfe dealt the initial strike on goal, which was saved by Velez. Mike Banner kept the attack going from the left side and made a quick cross to McBride, who scored his league-leading sixth goal of the season. Fire goalkeeper Jon Busch made three saves to post his second clean sheet of the season. Next up: The Red Stars stay on the road to take on the New York Red Bulls for a 2 p.m. (CST) match on Sunday, May 24. The game is televised on My50. SlideTackles.net thoughts: Everything changed for Chicago with the start of this three-game road trip. They finished their touches. And they caught quite a few breaks, which tended not to be the case in key situations on the Fire’s home stand. Toronto’s Amado Guevara easily could have had a couple of goals, but Busch made a great save in the 60th minute and Guevara’s free kick hit the cross bar in the 71st. Chad Barrett had a good strike from the right side in the 76th minute, with Busch making the save. But the biggest break for Chicago was in the 66th minute on a Sam Cronin cross to Barrett. Barrett was unmarked and his header went wide. He knew he blew a perfect opportunity when he covered his face. My50 Fire color commentator Chris Doran even said, “That was a freaking gift,” during the broadcast. That Fire fortune wasn’t in the air for the past two MLS matches at Toyota Park. Turns out, it was on the road all this time, and now Chicago is tied atop the East. Chicago Fire star midfielder Cuauhtemoc Blanco has been called up by the Mexican National Team for World Cup qualifying matches. The two games are June 6 against El Salvador, in San Salvador, and on June 10 against Trinidad and Tobago, at Estadio Azteca in Mexico City. "The national team manager is giving me another opportunity, and as I've said before, if I were called up, I'd be there," Blanco said in a release. Blanco appeared in World Cup qualifying matches for Mexico's past three World Cups, scoring nine goals. The Fire front office confirmed late Friday night that Blanco should only miss Chicago's June 5 home match against the Houston Dynamo. • Community soccer series: The Fire will launch their 2009 Chicago Fire Community Soccer Series on Thursday, May 21, at North Central College, 455 S. Brainard St., in Naperville from 5:30 to 7:30 p.m. The series features four free clinics throughout the summer throughout the Greater Chicago area. Clinics are open for ages 7 to 13 and are designed to instruct young athletes on the technical elements of soccer, while educating them on physical fitness, health and wellness. Chicago Fire player development coaches instruct the clinics, and participants will be separated into groups by age, with sessions tailored for various skill levels. The Fire's Baggio Husidic and Stefan Dimitrov will make a special appearance at North Central College. Details of the other three clinics will be announced at a later date. Clinics are free, but space is limited to the first 200 registrants. Participants must register by contacting the Fire at (708) 496-6754. This weekend will paint a better picture as to the strength of the teams currently atop MLS's Western and Eastern conferences, and some of the others giving chase. Read my Week 9 Major League Soccer preview at Examiner.com for the full slate of games this weekend. The Chicago Red Stars (2-1-2) attempt to rebound from a difficult loss when they host the Bay Area’s FC Gold Pride (2-3-1) for the first time in Women’s Professional Soccer league action at 7:30 p.m. Saturday at Toyota Park. Chicago is coming off a 2-0 defeat against Sky Blue FC, while FC Gold Pride is coming off a 1-0 defeat against St. Louis Athletica, even though the Bay Area out-shot St. Louis, 12-6. The Red Stars are set for the fourth game of a five-game home stand, having posted a 1-1-1 record. Chicago hopes to find its winning ways again and return to the form that led to a 4-0 victory against the Boston Breakers on April 25. Red Stars head coach Emma Hayes thinks Saturday’s matchup against Leslie Osbourne and FC Gold Pride is a carbon copy of Chicago’s makeup. More Web casts: The Red Stars and Ollin Omnimedia reached an agreement to provide Spanish-language Web casts for four home matches. They begin on Saturday against FC Gold Pride. The game is not televised. 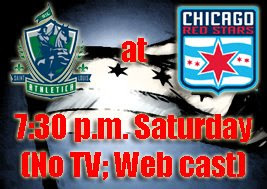 The Web cast is available at www.ChicagoRedStars.com. The other Spanish-language Web casts are May 23, June 21 and July 1. The Chicago Fire (2-0-6) might appreciate a chance of venue - or something - to remedy their constant pattern of draws. Anything that will break up the monotony of late. But they face a stiff Eastern Conference test when they hit the road for the next three games and take on Toronto FC (3-2-4) at 3 p.m. Saturday at BMO Field (game televised on My50). Chicago’s game plan is pretty clear-cut: Continue their relatively strong possession of the ball, finish a few more of their chances, and especially not allow a key defensive mishap. That has been the pattern, particularly in the past two games, which were 1-all draws against the Seattle Sounders and New England Revolution at Toyota Park. Toronto is coming off a 3-all draw against D.C. United, but that would have been a victory if not for a Marvell Wynne hand ball in stoppage time. The Reds are the only team to beat Chivas USA this year and have not lost since April 19. Toronto has a deeper and healthier roster to work with after food poisoning affected five players before the D.C. match. The Fire might not have defender Gonzalo Segares for a second straight game as he tries to heal his calf. SlideTackles.net prediction: Is it out of line to simply chalk in another draw? That is the pattern. And the matchup Saturday looks incredibly balanced. This game carries plenty of weight to it as Toronto and Chicago battle among the top of the East. The Chicago Fire (2-0-6) are making teams work. They’re possessing the ball. They’re controlling the rock so much that you would never know that this team is in the midst of five straight draws. Just look at the numbers. During this stretch, Chicago holds a 69-41 advantage in total shots and a 35-20 lead in shots on goal. The prime focus, though, is on Chicago’s past two home matches, both 1-all draws to the Seattle Sounders and New England Revolution. In those matches, the Fire generated a combined 27-9 edge in shots and a 12-4 margin in shots on goal. Outside of the Columbus match, the Fire have dominated offensively during this five-draw stretch - just not on the scoreboard, where it matters most. And if they want to stay around the top of the Eastern Conference, they will need to figure things out quickly when they travel to Toronto FC (3-2-4) this Saturday. So what is the answer to turning some of these draws into victories? Well, the isolated defensive lapses in the past two matches are definitely a big target. Those are a given. But some necessary focus has to be attributed to the team’s inability to finish some added chances on the offensive end. Something needs to be fixed, but Chicago is in a predicament because the team is completing most of the battle, other than the final tally. One thing that has changed since the start of the season is the way the Fire have attacked. It is a bit surprising that this team isn’t pushing their opponents’ defensive back line a bit more. Forward Brian McBride has gotten drawn back closer to the midfield on plenty of occasions. So has Patrick Nyarko at times. Early on this 2009 season, Chicago’s defenders were posting some lengthy assists, and some of those can be accredited to the Fire’s forwards pushing up to the defensive back line. On the flip side, teams quickly took notice of that attacking scheme and have decided to bunker down in their own zone. That is why you don’t see Chicago’s offense occasionally finding itself offside, and that is why you see most of Chicago’s attack coming from the flanks. The saying goes, “If it ain’t broke, don’t fix it.” The Fire are not necessarily playing a broken record, but it’s constantly skipping, and they need to dust off a few shortcomings to turn the tide. Major League Soccer and the Federacion Mexicana de Futbol unveiled its schedule and participating teams for the 2009 SuperLiga. SuperLiga begins play on Saturday, June 20, and the title match will be held on Aug. 5. MLS participants include the Chicago Fire and Chivas USA in Group A, and the New England Revolution and Kansas City Wizards in Group B. From Mexico's Primera Division, in Group A are San Luis and Tigres UANL, and in Group B are Santos Laguna and Atlas. Tickets are available through www.ticketmaster.com/mls, or by calling 1-800-745-3000. CLICK HERE for the full SuperLiga schedule and pairings. Check out a joint effort among eight of us Major League Soccer writers for Examiner.com's MLS Power Rankings. Chivas USA remains No. 1, while the Chicago Fire drop down slightly to the No. 4 spot. CLICK HERE for the full rankings. I contributed my own ballot, as did Chicago Fire Examiner Roman Kashuba. On Wednesday, Major League Soccer opened its online voting for the 2009 MLS All-Star Game, which takes place July 29 at Rio Tinto Stadium in Sandy, Utah. 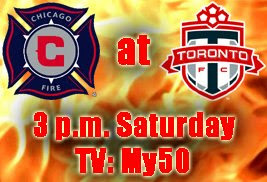 Vote for your favorite Chicago Fire players as the MLS stars take on English Premier League club Everton FC. CLICK HERE to vote now, and often! With Japan's women's team pulling out of a two-game set against the U.S. Women's National Team and a friendly against Canada, the two remaining parties decided to piece together their own matchup. The WNT and Canada will play each other at 6 p.m. (CST) on May 25. The two teams also face each other on July 19 in Rochester, N.Y., and July 22 in Charleston, S.C.
On Tuesday, the Chicago Fire and the United Neighborhood Organization announced a partnership to raise funds for UNO, which has served the Latino community since 1984. More than 650 students at Rufino Tamayo School, 5135 S. California Ave., in Chicago, were treated to a surprise visit from Fire midfielder Cuauhtemoc Blanco and defender Gonzalo Segares on Tuesday. "Soccer is at the heart of our community, and having Cuauhtemoc and Gonzalo come to our Rufino Tamayo campus only serves as an inspiration for our kids to achieve great things," UNO CEO Juan Rangel said in a release. The Fire-UNO community partnership includes more than 3,000 students and teachers from the UNO network of schools selling tickets to the Fire's May 31 game against FC Dallas. The proceeds benefit UNO, and tickets can be purchased from UNO network representatives through May 22. For more information about the United Neighborhood Organization, visit UNO-Online.org or call (312) 432-6301. And for information about UNO charter schools, visit UNOCharterSchools.org. The Chicago Red Stars received some good news from their perspective. That’s not the case if you were hoping to watch the U.S. Women’s National Team later this month. Japan decided to pull out of its two-game set against the U.S., citing concerns with the H1N1 virus. The games originally were scheduled for May 20 at Pizza Hut Park in Frisco, Texas, and May 23 at Rio Tinto Stadium in Sandy, Utah. Japan also canceled its May 25 matchup against Canada at BMO Field in Toronto. This announcement is disappointing from an international perspective. But the Red Stars of Women’s Professional Soccer now have the assurance of a full squad for their May 23 matchup against St. Louis Athletica at Toyota Park. Four Red Stars were on their way to play for the U.S.: Marian Dalmy (defender), Carli Lloyd (midfielder), Megan Rapinoe (midfielder) and Lindsay Tarpley (midfielder). St. Louis goalkeeper Hope Solo and defender Lori Chalupny also had been called up for the two-game series. In the Chicago area, Crystal Lake native Amy LePeilbet (defender) of the Boston Breakers and Naperville native Brittany Bock (defender) of the Los Angeles Sol were to join the U.S., as well. The Red Stars hope to remedy a disappointing 2-0 loss to Sky Blue FC this past Sunday. They host FC Gold Pride at 7:30 p.m. Saturday, May 16, at Toyota Park. BRIDGEVIEW, Ill. - Coming off their best game of the season, the Chicago Red Stars clearly registered their worst performance of the 2009 season. Sky Blue FC held an advantage in virtually aspect of its game as New Jersey earned its first victory, 2-0, on Sunday in Women’s Professional Soccer play at Toyota Park. The Red Stars’ performance was a complete 180 from their dominant 4-0 victory against the Boston Breakers two weeks ago. The Red Stars’ first loss puts them at 2-1-2 this season. Sky Blue earned its first victory to improve to 1-2-2. If not the first whistle, Sky Blue definitely established its presence within the first 10 minutes and continually picked part the Red Stars’ defense. New Jersey’s first tally came in the 7th minute, when Collette McCallum set up Sarah Walsh, who made a strong run from the right side and struck the ball underneath the arms of Red Stars goalkeeper Caroline Jonsson for a 1-0 lead. New Jersey gave itself some breathing room in the 79th minute with a Natasha Kai open-net (perhaps already bound for the net) goal. Kelly Parker made a run through the Red Stars’ defense to set up Kai for the 2-0 lead. Sky Blue held an 11-6 advantage in shots and a 5-3 advantage in shots on goal. The Red Stars did not post a single shot on goal in the first half, and several offensive opportunities were negated by offside calls, particularly a solid ball in the 63rd minute from Cristiane, who was looking for either Carli Lloyd and Karen Carney up front. Next up: The Red Stars host FC Gold Pride at 7:30 p.m. Saturday, May 15, at Toyota Park. No television or Web cast are available for the match. SlideTackles.net thoughts: The Red Stars were multiple levels below Sky Blue’s play on Saturday. From a tactical perspective, from an energy perspective, New Jersey dominated in every area. Chicago’s passing was certainly questionable. And the runs didn’t match the passing. There were multiple moments when Carney struck the ball from the wing and you could not tell if she was passing the ball or trying to hit the upper corner of the net. Though the offense was held at bay, the Red Stars’ defense was the most troubling. Sky Blue probably should have had a 2-0 lead in the first 10 minutes and had more than a few other opportunities to pad the lead. New Jersey’s front line had plenty of space to work with. Though Heather O’Reilly didn’t score a goal, she had way too much freedom to move the ball. Certainly some credit goes to Sky Blue’s energy, their passing and their runs to the goal. They appeared to be twice as fast to the ball than the Red Stars. Asked in the post-game if there will be any defensive changes, Hayes briefly acknowledged that there will be some adjustments.